When Jess is not busy doing all of her other work she will occasionally find herself in the mood to write poetry. Although most of this is very personal and often comes out of her feelings and circumstances at the time she does occasionally find herself inspired by things around her. The most notable piece of these is Calmly Insane in my Nest, which she entered into a forum poetry contest and won. 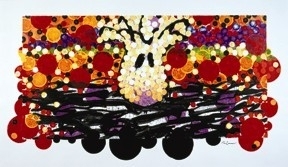 The piece was inspired on seeing a painting by Tom Everhart of the same name. And watch the colours go floating by. Calmly I sit here alone in my nest. Red, orange and purple way up in the sky. The harmony and turmoil surrounding, everywhere. Flying and running unhindered in the air. Calmly I sit here curious in my nest. Where do they come from? Where do they die? Why can’t I catch one? Why can’t I fly? Jealousy rose dancing and adding in green. Changing the picture and evolving the scene. But not alone, they are here all around. Would it hurt if one fell to the ground? Calmly I sit here insane in my nest. I read your interview on Nick Russel’s blog. He is a great guy. I was his first author interview.It is exciting to meet an author from the UK. Love your website especially the calandar and the works in progress. Those are pretty cool. good luck on the happy road of writing.